A Soursop project was officially launched at the Diamonds Government School on Thursday, November 9th. The Richmond Vale Academy is propagating 600 seedlings to be handed over to the Ministry of Agriculture, as part of the Ministry’s drive to plant 1 million soursop trees in St. Vincent in the next ten years. Present at the launch was Minister of Agriculture, Hon Minister Saboto Caesar, Stina Herberg of the Richmond Vale Academy (RVA), Principal of the Diamonds Government School Mrs Harry and many enthusiastic children!! 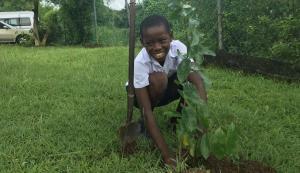 Following the launch, two soursop trees were planted in the schoolyard and the students who planted them promised to look after them to maturity. 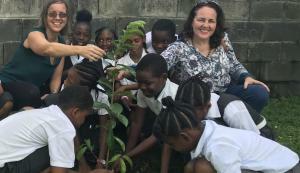 Co-Founder of the Fund, Louise Mitchell presented a book on Wildlife of the Caribbean to the Principal, encouraging her teachers to teach the children about conservation.